Included in J. tenuis in Michigan Flora. Moist to seasonally dry sandy prairies, sandy fields, and borrow pits. Like a large specimen of J. tenuis with a very lax, large inflorescence, and often recognized as a variety of it; Michigan collections are (35–) 60–90 cm tall with inflorescences 7–20 cm long; J. tenuis is rarely more than 60 cm tall and usually has relatively congested inflorescences 1–10 (–13) cm long. In J. tenuis, the flower bearing portion of the ultimate branchlets (when more than 1-flowered) are 1/4 as long to roughly equal to the length of their peduncle. In J. anthelatus, the ultimate inflorescence branchlets have the flower-bearing portion about 2/3 as long to ca. 2.5 times as long as the peduncle. MICHIGAN FLORA ONLINE. A. A. Reznicek, E. G. Voss, & B. S. Walters. February 2011. University of Michigan. Web. 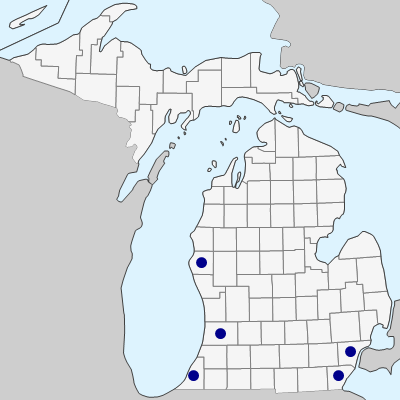 April 21, 2019. https://michiganflora.net/species.aspx?id=1499.